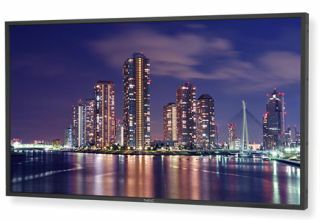 NEC Display Solutions of America has announced the addition of a 55-inch model to its line of P Series large-screen displays. The P552 is a professional-grade, industrial-strength LCD display intended for 24/7 operation in venues such as quick-service restaurants, airports, public information environments, healthcare facilities and retail stores. This model includes thermal protection, internal temperature sensors with self-diagnostics and fan-based technology to prevent overheating. The P552 is enhanced with Open Pluggable Specification (OPS) technology, digital loop-through capabilities, reduced depth, 10 percent lower power consumption and built-in 10-watt speakers. The OPS-compliant expansion slot adheres to the Intel specification that aims to standardize and simplify slot-oriented digital signage installations. The P552 will be available in February 2012 at a minimum advertised price of $3,199. Meanwhile, a P552-AVT display will be available at a minimum advertised price of $3,399 and the P552-TMX4D (2x2 TileMatrix Video Wall Solution) at $17,999. All displays ship with a 3-year parts and labor warranty, including the backlight.